A comfort food beloved worldwide finally meets gourmet convenience. Each hearty dish is loaded with exceptionally tender ground beef and bright, colorful vegetables slowly simmered for maximum flavor in rich, velvety brown gravy. Topped with a blanket of creamy mashed potatoes, there's no doubt this irresistible meal will fill everyone with warmth and comfort from the inside out. Better yet, there's no prep! 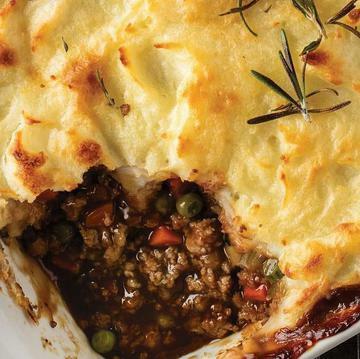 Fill your home with the hearty aroma of Beef Shepherd's Pie in less than an hour with no thawing required. That's right - this meal goes straight from freezer to oven. Do not thaw. �Oven: Preheat oven to 425�F. Remove film from tray. Place tray on baking sheet on middle rack of oven. Bake 55 minutes or until internal temperature reaches 165�F.